Cook up this Sri-Lankan Fish Curry and serve with dinner. 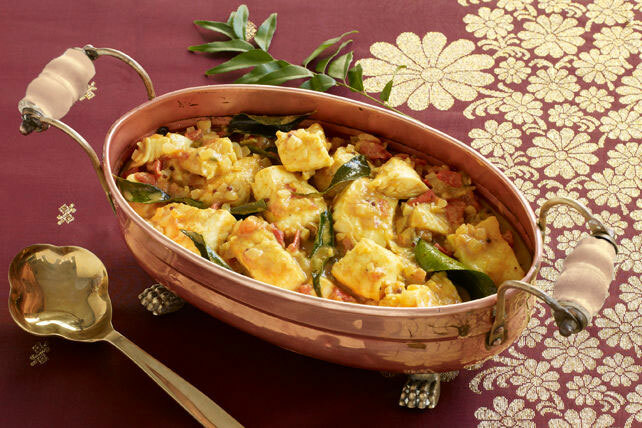 This rich and hearty curry pairs great with a mixed green salad and can be made in 45 minutes! Microwave water and tamarind in medium microwaveable bowl on HIGH 1 min. Mash with fork; let stand 5 min. Strain tamarind through fine-mesh sieve over bowl; firmly press strained tamarind to remove all liquid. Reserve strained liquid in bowl; discard tamarind in sieve. Add coconut milk, dressing, red pepper and turmeric to reserved liquid; mix well. Heat oil in large skillet on medium heat. Add next 7 ingredients; cook and stir 5 min. or until onions are crisp-tender. Stir in tomatoes; cook and stir 5 min. Add coconut milk mixture; stir. Bring to boil. Add fish; cover. Simmer on medium-low heat 10 min. or until fish flakes easily with fork. Transfer fish to platter; top with sauce. For a more authentic dish, prepare using kingfish steaks or fillets. Or, prepare with any other white fish, such as haddock, red snapper or cod.